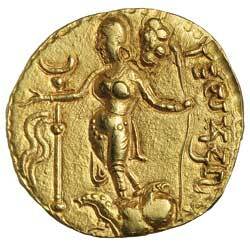 GUPTA COINAGE, Samudragupta, (c.335-380 A.D.), gold dinar. (7.60 g), obv. Tiger-slayer type. with the king standing to left, wearing ceremonial turban and dhoti, drawing his bow and aiming at an open mouthed tiger which rears up in front of him as he tramples on it, legend 'Vyaghraparakramah' at right, crescent above lion's head, rev. Raja Samudraguptah, in field to right, the goddess Ganga standing left, on an elephant-headed fish (makara), she holds a long-stemmed lotus in left hand, her empty right hand is outstretched and a crescent topped standard decked with ribbons is in field to left, (BMC pl.II, 14. 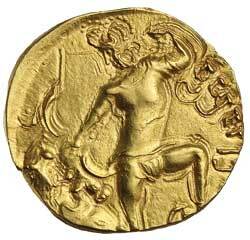 Bayana Hoard pl.VI, 9). Broad flan, well centred and well struck, of fine style, extremely fine and very rare.